Amongst species of colonial snapping shrimp, the capacity for defense versus reproduction in queens varies with the level of cooperation, according to a study published March 14, 2018 in the open-access journal PLOS ONE by Sally Bornbusch from Duke University and colleagues. In queens of snapping shrimp species that are weakly eusocial, the researchers found strong trade-offs between fighting claw mass and egg number. In contrast, this trade-off was smaller or absent in queens of species that are strongly eusocial. In addition, colony size was also a factor: in large colonies of highly eusocial species, trade-offs between queens' weaponry and fecundity were smaller. 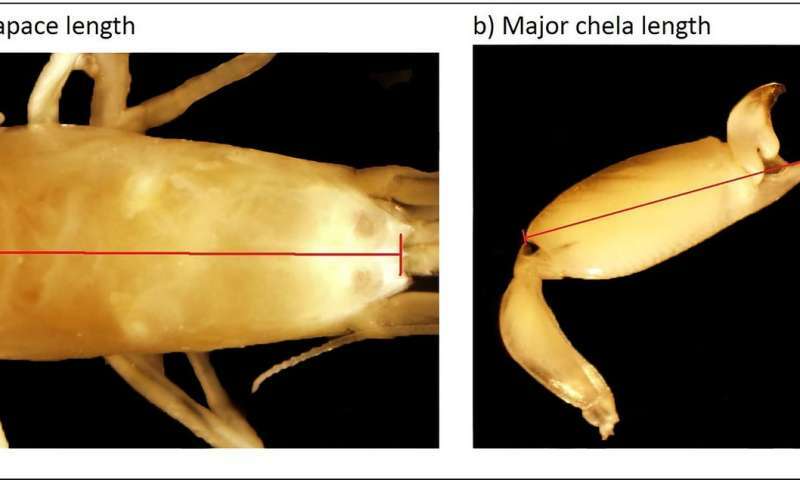 This work suggests that in snapping shrimp species that are less cooperative, female-female conflict within the colony has selected for queens that retain weapons at a significant cost to fecundity. Conversely, in species that are more eusocial—notably those with a single queen per colony—protection by other colony members could be an explanation to a reduction in this cost of weaponry in queens.